“REPENT YOU WICKED PASTOR!” This was just one of many Facebook comments I received when I posted an account of what happened at the Cheesecake Factory in Austin on July 6. My wife and I were celebrating our 20th anniversary when our waiter, Trey, announced that he, too, had some good news: He was getting married! I asked who the lucky girl was and he said it wasn’t a girl. For the record, I’m a Bible-believing, evangelical Christian who believes that God has ordained marriage to be between a man and a woman only, regardless of what the current laws say. I also understand that we are in the midst of a sea-change concerning life in America and traditional morality. We live in a post-Christian nation that is rapidly turning anti-Christian. Yet, as a born again believer in Jesus Christ I want to be gracious, winsome and as loving as possible in order to win an audience with those who live apart from the grace of God. In other words, when a non-believer meets me, I want them to think that I am the nicest Christian they’ve ever met. What? No lectures about what God thinks of gay marriage? Nope. No anti-homosexual quotes from the Bible? Nahhh. In fact, I didn’t preach to him at all. I did, however, place along with my payment for the meal, two Gospel tracts that clearly outlined what God demands from each one of us: trust in the Savior and repentance. Even more importantly, I left a very generous tip! What was my reason for congratulating him? The Bible says to “Rejoice with those who rejoice.” He was happy; I was happy he was happy. I wasn’t happy that he was lost and headed for a miserable life, both temporally and eternally. 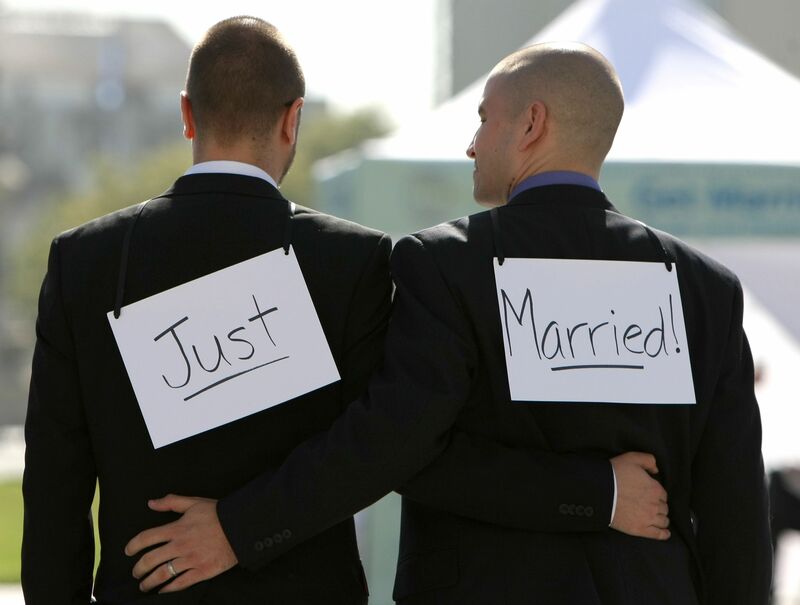 (Statistically, homosexual marriages are doomed to failure.) I wasn’t celebrating his sin. I hated that he didn’t know Jesus and that he was in violation of God’s way of doing things. I hated that! But, he was happy. I was on my 20th anniversary. With my wife. He was working. It was not the time to judge Trey’s actions. As a matter of fact, Christians are not to judge any unbeliever’s actions. If you want to frown, shake a finger, scold or heap condemnation on those who don’t live or believe or act like you do, that’s your choice. As long as I live in the world, I’ll try to engage people, meet them where they’re at, and hopefully win them over so that they may see Christ in me. And on occasion, I’ll even wish them well. Steve I want you know that I love you and Karen and am always amazed by your wisdom and mannerisms. I do see Christ in you and the wisdom of the Holy Spirit in your actions with people. Your advise has been most helpful to me and Myrna. I wish I could be able to hang out with so I could have a little of your influence rub off. You know the old expressing, it’s easier to fall down a latter than to fall up one. Be blessed my friend and may the lord continue to use you mightily. Mike, You are so missed, my friend! I applaud you Steve, you did what you felt was right as a Christian by trying to share your Gospel and you also did what was decent and respectful as a person by not condemning or lecturing. If your attitude was more widespread I think evangelists would not only have a better reputation but also more success at spreading the Gospel. Anti gay Bible verses and condemnation would not have had any impact on him, as an openly gay man I am sure he has heard all of that before. However by treating him decently and leaving him a tract you showed a positive example of Christianity. This might counter any negative impressions of evangelists he might have and allow him to read your tracts with an open mind. I don’t know how likely it will be that your message will reach him but surely more likely than a message of contempt and disrespect. Thank you for your very nice encouragements. I do try to be, as you want to be, a great example of of our very different beliefs. Awesome testimony of how to reach the lost. I have learned this the hard way of how to share truth with people who have been deceived. Don’t look at individual sin, we are all sinners and so desperately need a savior. Steve, I want to thank you. 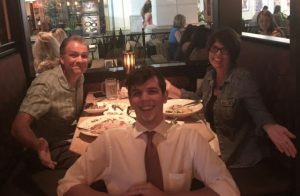 That “gay waiter,” Trey, is an old friend of mine from high school for whom I have been praying many years that he might repent and believe the gospel. I’m glad that he is encountering other Christians who believe the gospel, stand firm on the gospel, do condemn homosexuality as sinful, but also make it a priority to be winsome and kind, in short: Christians who speak the truth in love.